“Well you’ll have to ignore the Road Closed sign here and here,” the government official indicated on a map as we sat at a picnic table in Australia’s rough and tumble Goldfields region. Torrential rains the week before had wreaked havoc and the normally semi-arid desert had given birth to flood plains, rivers and streams. 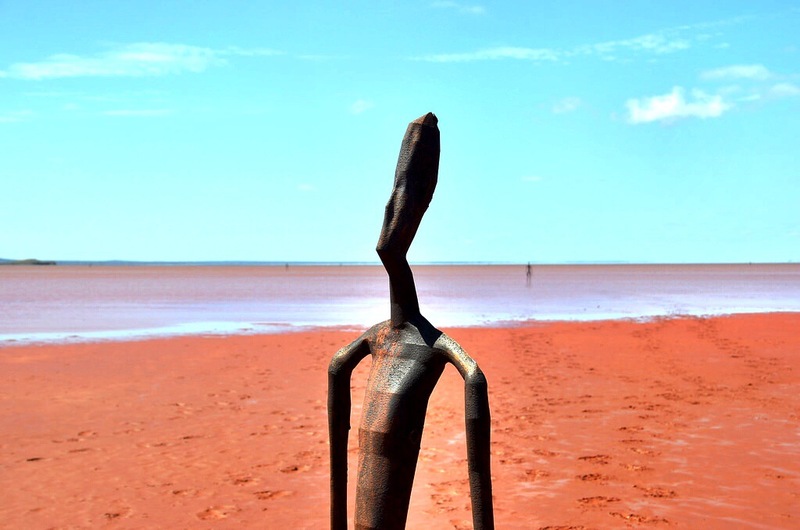 Many of the roads were closed as a result, making getting around a challenge and threatened to cancel one of the major reasons I was in the Goldfields in the first place; to see the famous sculptures covering Lake Ballard. An ephemeral salt lake, the lake is almost always dry, except in extreme instances of flooding. The last time anyone could remember Ballard having water was 20 years ago, and even that is up to debate since no one was actually sure if they had seen it. That’s the nature of Western Australia, its size is so immense that aliens could land and never attract attention. 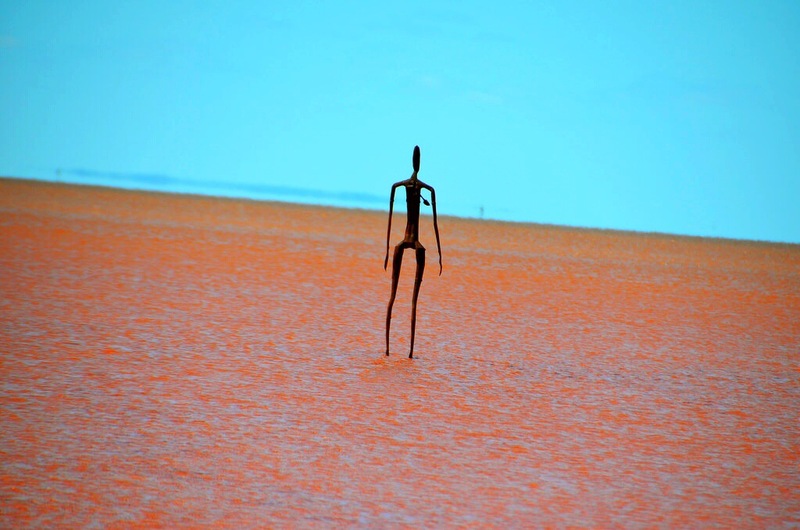 That’s actually what the photos of Lake Ballard promised, an encounter with alien-like creatures created by one of the world’s top artists. 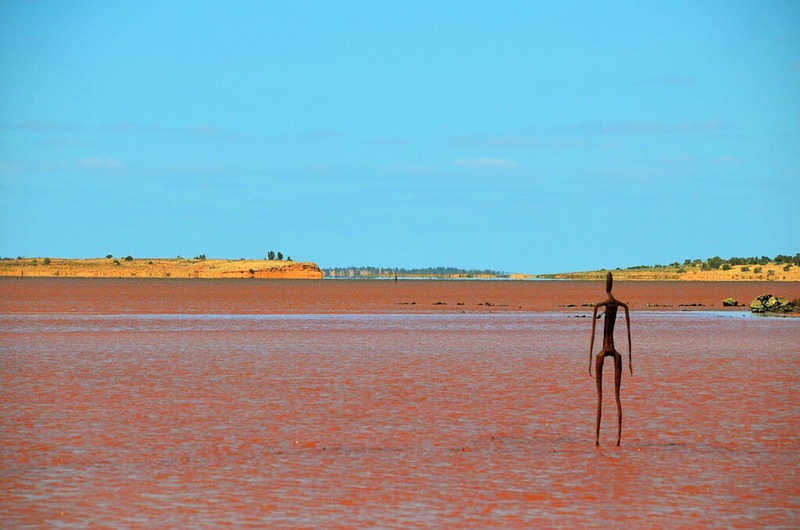 In 2003, to commemorate the 50th anniversary of the Perth International Arts Festival artist Antony Gormley was commissioned to produce a unique art installation, a series of 51 sculptures that now cover 4 square miles of Lake Ballard. The original concept was to have the statues in Perth for, you know, the PERTH Festival. Artists are fickle creatures though and Mr. Gormley instead hopped in a helicopter and scoured the Western Australian countryside for the perfect spot for his soon-to-be-creation. He settled on the remote, somewhat forgotten Lake Ballard and the rest is proverbial history. The Inside Australia sculptures installed on this millions of years old lake feature images of real people, scanned digitally before they were shrunk by 2/3 and artistically reinterpreted, creating alien forms in the process. Each sculpture has a spirit to it and their positioning constantly leads you to the next one, flickering apparitions in the distance. And that’s why I wanted to go, to see this remarkable and intensely unusual place for myself, but Mother Nature threatened to ruin my plans. The Wet, as it’s called, had closed nearly everything in the Goldfields and my guide didn’t think we’d be able to make it to Lake Ballard. A few phone calls, a secret picnic table meeting and after unofficial official permissions were given, we were allowed to drive to the lake as long as we didn’t tell anyone. And didn’t break down. Or get lost. Or anything else that would require other humans to know of our existence. We arrived and my guide told me to take off my shoes. I complied, but didn’t know what to expect. The lake is normally dry, easy to walk across and to capture those bizarre visual effects salt lakes and flats are known for. The rain complicated things though and I wasn’t sure if we’d be met with a marsh or even a proper lake. The answer was neither, not really. The rarely moist lakebed, when confronted with actual rainwater, turned into a dense layer of mud. No, mud is too kind a term. It was paste, the thickest and gooiest mud I’d ever encountered. With a sickening sucking sound every time I took a step, my feet soon became encased in a thick layer of mud that was dangerously slippery, threatening an epic spill with every new step. So it was cautiously that I ventured onto the lake, but those risks were soon well rewarded. Immediately, the scale of the art installation was apparent. While the first few statues were within easy reach of the car park, I could see dozens more in the distance, looking like movie-inspired aliens just landed from a long flight. We were the only humans there and it was undeniably eerie, the ghosts in possession of the statues had their own unique presence, and I felt as if they would stir to life at any moment. In my heart, I wanted to walk the 4-mile circuit and experience the entirety of the art exhibit. But practical concerns reigned supreme that day. It took forever to walk even a short distance thanks to the paste-mud and the super slippery surface of the lake. 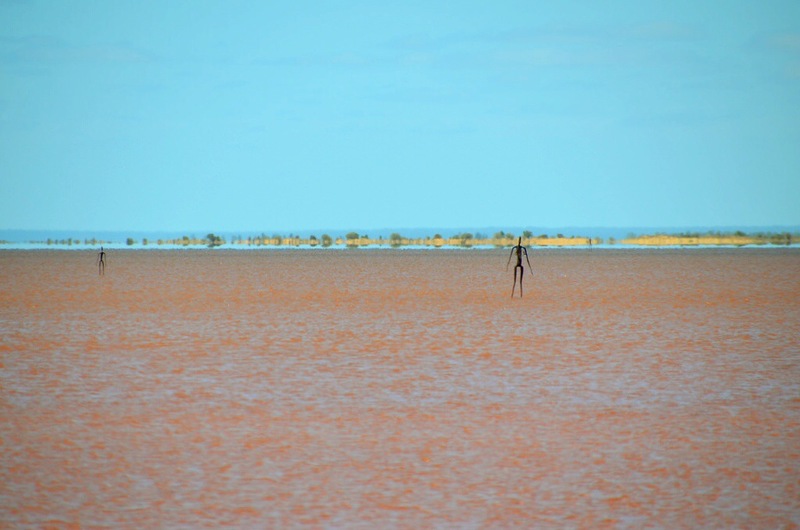 In some spots there was even standing water, a bizarre occurrence apparently for Lake Ballard, and several inches of Wet lapped at the feet of the statues, pieces that had never before felt the splash of water. I didn’t need to see the entire lake though to appreciate that moment. Alone there in an impossibly remote part of an already impossibly remote continent, I was humbled. I didn’t care if most people had never heard of Lake Ballard and probably wouldn’t care that I’d visited, but I cared. It was important for me to be there, to be in a place defined by size and beauty and to allow myself be humbled by the experience. And I was. I was deeply humbled and nearly cried by the realization of the experience. My reverie was broken by the beep-beep-beep of a garbage collector gathering up trash from the car park. Apparently the road closures didn’t stop normal life after all, but it did allow for a brief pause that gave me a precious moment of solitude and quiet introspection in a very strange corner of Australia. Where is this located exactly ? Very otherworldly, I’d love to see this in person. 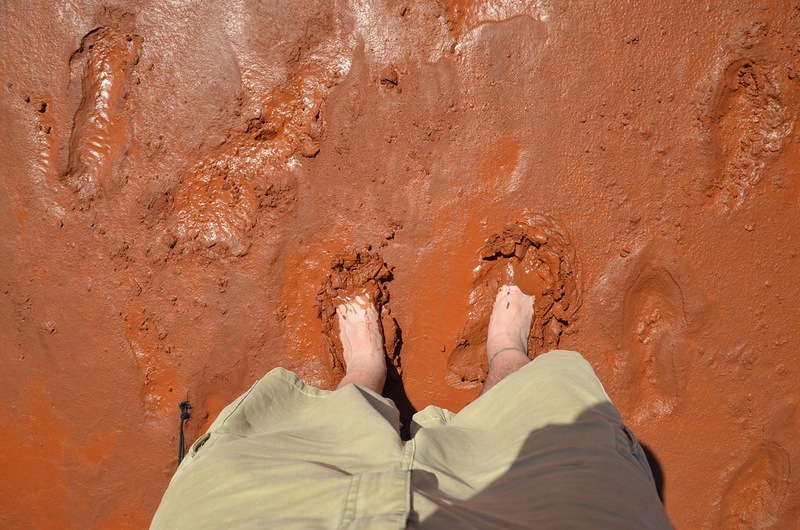 Love these photos that make it seem you’re on another planet and great contrast between the red mud and blue sky.